Government partners: Economic Planning Unit, Department of Wildlife and National Parks, Terengganu State Forestry Department and Terengganu State Government. 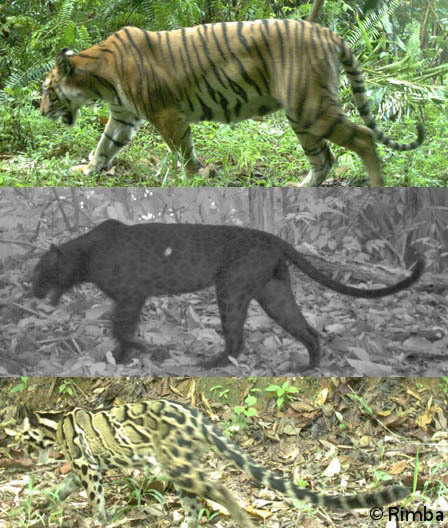 This project aims to conserve three big cat species in the Kenyir-Taman Nagara Core Area, Terengganu: the Malayan Tiger Panthera tigris jacksoni (‘Harimau belang’ in Malay), the Leopard Panthera pardus (‘Harimau kumbang’) and Clouded Leopard Neofelis nebulosa (‘Harimau dahan’). The name Harimau Selamanya literally means ‘big cats forever’. This project continues the work started by the Kenyir Wildlife Corridor Project and Project Black Cloud. This project will not only help contribute to the conservation of large carnivores and other wildlife in and around Taman Negara and Primary Linkage 7, but also contribute to the Department of Wildlife and National Parks’ National Tiger Survey and National Tiger Conservation Action Plan.